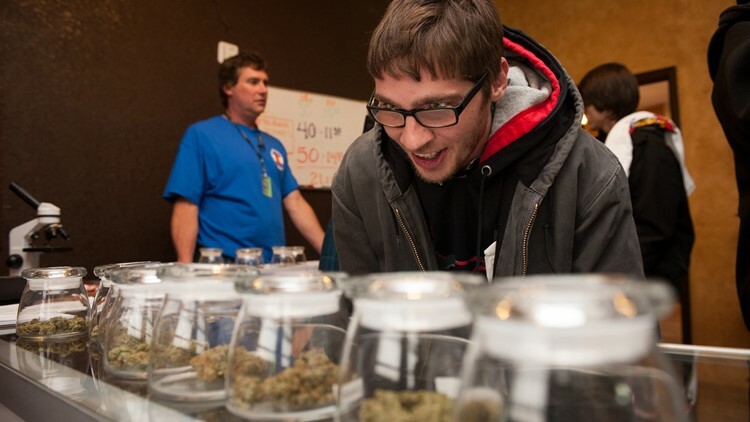 Tyler Williams of Blanchester, Ohio selects marijuana strains to purchase at the 3-D Denver Discrete Dispensary on January 1, 2014 in Denver, Colorado. Legalization of recreational marijuana sales in the state went into effect at 8am that morning. The Supreme Court refused Monday to referee a simmering dispute between Colorado and two neighboring states over the cross-border impact of marijuana legalization, heartening legalization advocates who feared the high court could have rolled back their gains. WASHINGTON — The Supreme Court refused Monday to referee a simmering dispute between Colorado and two neighboring states over the cross-border impact of marijuana legalization, heartening legalization advocates who feared the high court could have rolled back their gains. The justices denied an effort by Oklahoma and Nebraska to bring their grievances about pot-related crime directly to the nation's highest court without seeking to go through lower courts first. Justices Clarence Thomas and Samuel Alito dissented, saying they would have heard the states' complaint. "The plaintiff states have alleged significant harms to their sovereign interests caused by another state," Thomas wrote. The petition had been pending at the Supreme Court for 15 months while the three states and the federal government made their arguments. Oklahoma and Nebraska complained that pot purchased legally in Colorado is being transported illegally into or through their states, overwhelming police and courts dealing with a sudden influx of smugglers. An ounce of high-quality marijuana selling for $200 at a state-licensed Colorado store can fetch three times that on the East Coast black market, police say. "The state of Colorado authorizes, oversees, protects and profits from a sprawling, $100 million-per-month marijuana growing, processing and retailing organization that exported thousands of pounds of marijuana to some 36 states in 2014," the complaining states argued in their latest brief to the court. "If this entity were based south of our border, the federal government would prosecute it as a drug cartel." USA TODAY highlighted the flow of marijuana from Colorado into small towns across Nebraska in 2014. It found that felony drug arrests in Chappell, Neb., just 7 miles north of the Colorado border, skyrocketed 400% in three years. The neighboring states also argued that the Constitution's supremacy clause leaves the issue to the federal government, which still considers marijuana to be an illegal substance. Since their lawsuit was filed, sheriffs from several states and an anti-crime group have sued Colorado in lower courts. Colorado, where residents voted to legalize marijuana in 2012, argued it is not responsible for the behavior of individual purchasers. The state prohibits interstate commerce of the drug and requires background checks for growers and vendors. Legalization advocates say the court's decision should prompt Nebraska and Oklahoma to reconsider their approach. "At the end of the day, if officials in Nebraska and Oklahoma are upset about how much time and resources their police are spending on marijuana cases, as they said in their briefs, they should join Colorado in replacing prohibition with legalization," Tom Angell, the chairman of the Marijuana Majority, said in a statement. "That will allow their criminal justice systems to focus on real crime, and it will generate revenue that can be used to pay for healthcare, education and public safety programs." Colorado officials argued that Nebraska and Oklahoma were inappropriately trying to influence what voters in the Centennial State had decided for themselves. "Colorado does not intend, nor has it attempted, to reach across the border to invade the plaintiff states’ sovereign rights," it said in its brief seeking to have the challenge dismissed. "Indeed, it is Colorado’s sovereignty that is at stake here: Nebraska and Oklahoma filed this case in an attempt to reach across their borders and selectively invalidate state laws with which they disagree." The justices had asked the Obama administration to weigh in, and the Justice Department responded by urging the court to stay out of the case. "Entertaining the type of dispute at issue here — essentially that one state’s laws make it more likely that third parties will violate federal and state law in another state — would represent a substantial and unwarranted expansion of this court’s original jurisdiction," Solicitor General Donald Verrilli said. Colorado, Alaska, Oregon, Washington state and Washington, D.C., have legalized adult recreational use, and 23 states and the District of Columbia permit some form of medical use. That’s despite the fact that marijuana remains an illegal drug and Schedule 1 controlled substance at the federal level. While several legalization advocates hailed Monday's decision as a major victory, California-based cannabis attorney Aaron Herzberg of CalCann Holdings said the court’s action doesn’t actually change anything. "They’ve simply made a decision to be hands off and to allow the states to experiment…" he said. "It would have been extremely concerning had this Supreme Court taken this case up. We can breathe a sigh of relief, knowing that the court system is not going to intervene." Herzberg said the federal government needs to bring much-needed clarity to the situation, including access to banking and potentially reclassifying marijuana from its current Schedule 1 status. That likely won’t happen until after the presidential election, he predicted. "There's still huge federal issues that are in the way of this industry succeeding," he said. "We really need to see some leadership on this on the federal front." The attorneys general of Oklahoma and Nebraska did not immediately respond to requests for comment Monday.